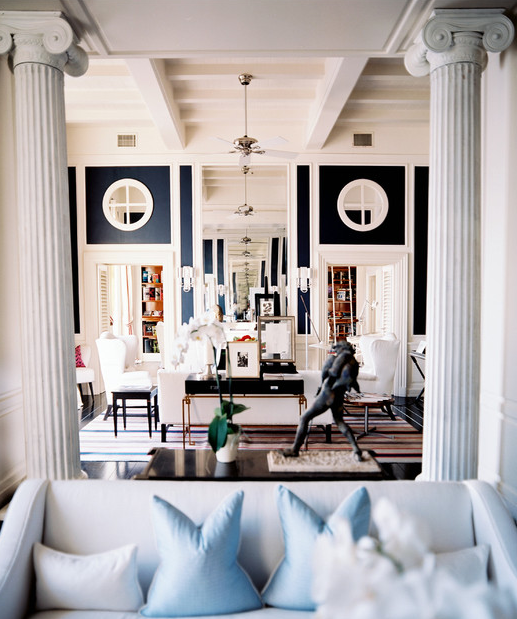 It includes house tours of designers John Robshaw, Palmer Weiss, Celerie Kemble & Lulu De Kwaitkowski. The best part of Lonny is that they almost always seem to include some children's designs in ever issue and this one is flooded with some inspirational shots. Lulu De Kwiatkowski's twin's bedroom (Mateo and Francesco). 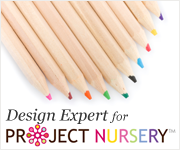 A more sophisticated children's room which flows harmoniously with the rest of their home. Honestly I love their whole house, my dream: casual, yet sophisticated and modern. Palmer Weiss's daughter Amelia's room. The pink walls add femininity as the bold orange headboard and oversized photographs modernize the room. The playroom is covered in grasscloth, a sophisticated touch yet is practical as it hides holes so that artwork can be rotated throughout the room. 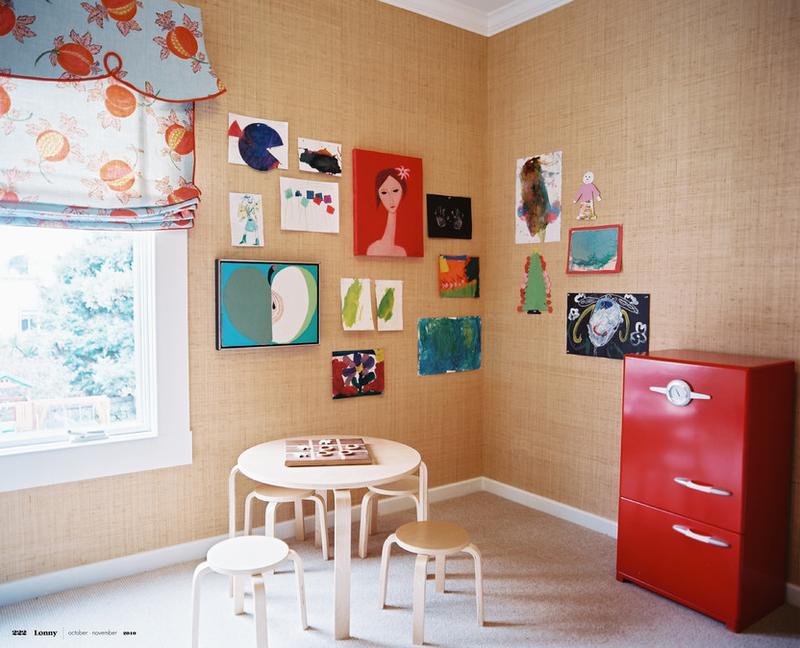 Furniture pieces shown include the Svan play table as well as the Pottery Barn Kids retro kitchen fridge. 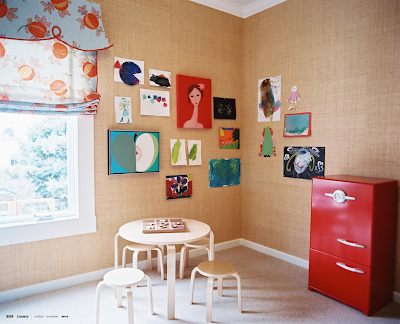 Celerie Kemble's boys' room plays with overlapping colors and patterns to create visual interest in a small space. The apple green and navy is so fresh! On another note, this issue also showcases beautiful looks into the J.K. Place Hotel in Florence and Capri. Some of my favorite hotels ever! Hopefully I'll be going there for a visit sooner than later! Just LOVE Italia! Like the room of Celerie Kemble. Very nice colours! Any phenomenal come alive the fact that certain most women for example may very well be gucci replica together with washed out after some time. Patent leatherette during this view is usually thought of as a much more interesting equal or simply variant within the typical synthetic leather. Patent leatherette affordable handbags are definitely basically billed. It can be a well-known experience the fact that solutions composed of legitimate or simply actual synthetic leather happen to be pragmatically outrageously expensive. That could be given that synthetic leather is manufactured out of legitimate four-legged friend complexion, has happen to be the natural way together with tediously manufactured to generally be louis vuitton replica uk meant for affordable handbags. Then again, patent synthetic leather is certainly synthetically made to appear to be many any elements for legitimate synthetic leather. Quite often, how to attract really hard to distinguish an individual within the many other. Patent leatherette sacks is usually mainly because cool even though chanel outlet mainly because synthetic leather affordable handbags, however , happen to be a great deal more good relating to price tags. Happen to be synthetic leather patent affordable handbags clutches mainly because strong together with well-performing mainly because synthetic leather sacks? They may be. However , isn't incredible the fact that during this view, superior is certainly large during actual synthetic leather chanel outlet. Yet, there's lots of systems you can actually discover together with undertake to guarantee an individual's patent leatherette handbag will at the same time survive longer together with beauty valuation is usually kept to your at best point in time. Patent leatherette is usually louis vuitton outlet uk easily enough, for example synthetic leather sacks.